Automatic controls for feeding water, maintaining temperatures, pressures, and slurry drain are, fool proof, efficient and are of international standard. Manufactured as per Designs and Drawings approved by The Chief Controllers of Explosives. Manufactured under ISI quality marking. Acetylene Gas Generator: The KVK Acetylene Gas Generator is of an advanced design, incorporating several features not ordinarily found in other generators. 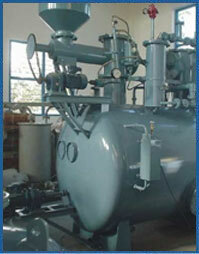 The KVK Acetylene Gas generator and Acetylene Gas Cylinder are fully automatic. The KVK Acetylene Generator and Acetylene Gas Cylinder are advanced design, incorporating several features not ordinarily found in other generators and cylinders. The KVK Acetylene generator is fully automatic. Pneumatically controlled valves and highly sensitive sensors, integral with the temperature control instruments, perform all operations. These in turn open the water inlet valve or residue drain valve etc. Two hydraulic pumps help to open and close the supply of calcium carbide, which is fed into the generator by screw feed conveyors. The screw feed mechanism and the agitators are operated by flameproof motors and fittings. The entire operation is perfectly synchronized to achieve maximum efficiency and simplicity in operation. Any failure, whether it is of power supply, water or air is signaled visually and also audibly when an alarm bell rings to alert the operator. Temperature Control: The KVK Acetylene Generator can be set to operate at a given temperature, regardless of the size of carbide used or temperature of the cooling water, A sensitive sensor actuates a pneumatic control that adds water into the generator tank when the temperature exceeds the set limit, thus maintaining a given standard temperature. This helps in complete utilization of carbide, which is a very expensive raw material. High Pressure Control: If all the gas generated cannot be drawn in by the compressor and passed on the filling manifold, either due to low capacity of the compressor or fast generation, gas pressure will gradually build in the generator. When the gas pressure reaches a predetermined level (about 0.5 kg/cm2) carbide charging will be cut off automatically and further generation of gas is stopped. There is no expensive gas holder with the KVK Acetylene Generator. This item alone will reduce the investment on such a plant. Further, as the gas generated is always at a positive pressure, the pumping cost is also reduced. Since the generator is constantly at a positive pressure, (once the plant has been purged with Nitrogen) no air can enter the system, and it is this feature which makes the "KVK" Plant inherently very safe. Water Level Control: If excessive water enters the generator to cool it and the water level goes above the high level mark, the water-level control instrument will immediately discharge the excessive water thus maintaining the level between the acceptable high and low level marks. No loss -Carbide charge: No gas is lost or wasted while charging the carbide because one section is completely sealed off from the generator by a high pressure hydraulically operated valve. All the above controls are automatic and require no attention from the operator. Condenser :The Acetylene gas leaving the generator is hot and carries with it some water vapour and other impurities. The condenser will cool the gas, thereby condensing the excessive moisture in preparation for its subsequent removal. The condenser is of ample proportion to suit local conditions and ensures complete cooling, provided that sufficient water supply is maintained. Low Pressure Drier: The drier is charged with calcium chloride. This absorbs the moisture in the gas. In case a certain amount of moisture is necessary to enable the chemical purifier to function effectively, a by-pass is provided to allow part or whole of the gas to be directly admitted into the chemical purifier. Chemical Purifier: This consists of two layers of regenerative chemicals, which remove additional impurities. The purifying agent may be reactivated for re-use by the atmosphere air. For continuous operation one extra charge of chemicals can be kept in open wooden trolleys. Water Scrubber :The equipment is installed between the chemical purifier and Acetylene compressor, which helps to remove impurities from the gas if any. Acetylene Compressor: For filling of the cylinders an I.R. make reciprocating, oil lubricated, multi-stage, Water submerged compressor with intercoolers, safety relief valve for each stage, driven by a 15 H.P. Flame Proof Motor confirming to IS: 2148-68 (Gr.II-B) is provided. High Pressure Drier:This consists of a battery of three high-pressure vessels. The first is filled with metal filler, while the second and third are filled with anhydrous calcium chloride. It is very important that the high-pressure drier is fully filled up with Calcium Chloride, as any void in high-pressure area is against the required safety. Filling Manifold :This consists of a battery of filling connections to connect to the gas cylinders. Non-return valves are provided in various sections of the pipeline to the filling manifold. These non-return valves are extremely important for the safe operation of the plant and should be periodically examined. The manifold should also be periodically cleaned to remove rust and scales, (iron rust rushing though the pipeline at high speed could generate a spark and cause fire). The cylinder filling pig tails (flexible hose pipes) should also be periodically cleaned to ensure that they do not burst during filling operation, (if they do burst, a fire could occur due to sudden discharge of Acetylene). Flameproof motor with a buffer tank includes the instrument air compressor. Statutory requirement of distance as per Explosive Dept. Acetylene Plant and Carbide go down Should be: 9 meters from time pits. 15 meters from public road. 15 meters from Electricity room. 30 meters from any other bldg 90 meters !tom Oxygen Plant Air intake point Acetone go down of 2,500 Litres capacity should be 6 Meters from any other premises.